Here is a picture of how our booth looks at our shows. You can see our earring racks, jewelry, and our telephone wire baskets. Also included is our great African fabric hanging in the back of the booth. This is Jan and Gary. You will find them at all our shows. 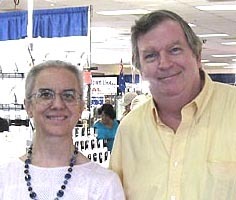 We have been working together at shows for over 20 years.